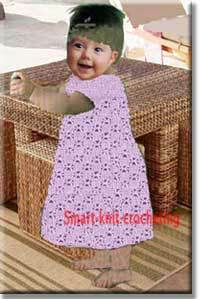 Crochet Dress for Girl - Pattern and Description. This crochet dress is for a girl about one year old. Stitch pattern which I used for it is pattern #5 from Easy-crochet-pattern page. I used a hook 2.5 mm to make a swatch. My gauge is: 1 cm = 2 sts. 1 cm = 1 row. Don't be upset if you have slightly different numbers. The dress has a simple pattern and doesn't require exact match. In case the difference is significant, you should recalculate number of stitches necessary to match a crochet dress pattern. Crocheting Basics page explains how to do it. 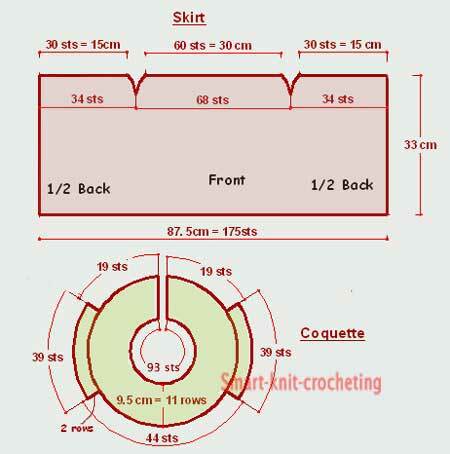 To crochet this dress you will need to make two parts - a skirt (pattern #5) and coquette (double crochets). Follow description below. Step 1. 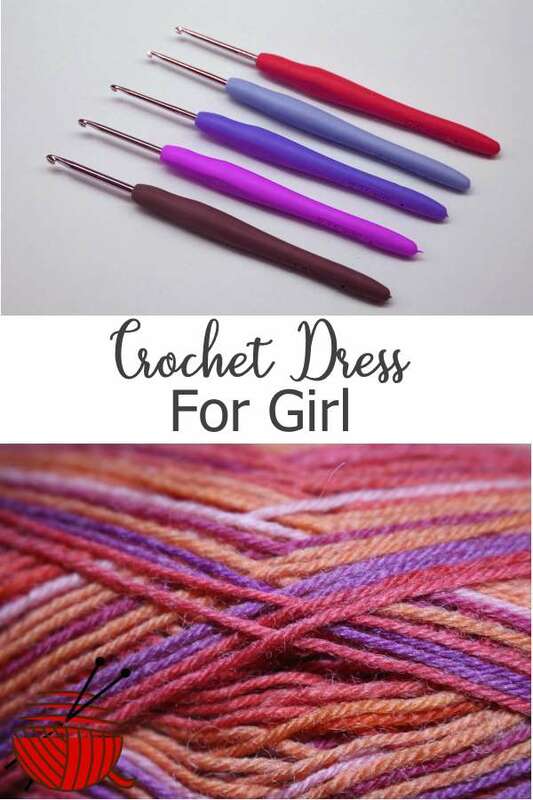 Make a skirt for the crochet dress. Crochet 4 more rows. Separate a piece into three parts: 34 sts (1/2 back), 68 sts (front), 34 sts (1/2 back). Crochet them separately (two more rows) making decreases for armholes according to a crochet dress pattern above: work two dc together at the beginning and at the end of every row. Total width of the dress skirt at the top is 120 sts (60 cm). Step 2. Make a crochet dress coquette. 2nd : *5 double crochets, work two dc into one stitch*. Repeat from * to * to the end of the row. 94 sts + 15 sts = 109 sts. 4th : *6 double crochets, work two dc into one stitch*. Repeat from * to *. 109 sts + 15 sts = 124 sts. 6th : *8 double crochets, work two dc into one stitch*. Repeat from * to *. 124 sts + 13 sts = 137 sts. 8th : *10 double crochets, work two dc into one stitch*. Repeat from * to *. 137 sts + 12 sts = 149 sts. 10th : *12 double crochets, work two dc into one stitch*. Repeat from * to *. 149 sts + 11 sts = 160 sts. Crochet sleeves : (39 sts) Crochet two rows for every sleeve adding 1 dc at the beginning and at the end of the row. 39 sts + 2 x 2 sts = 43 sts. Finish a sleeve with one row: after each 3d stitch work two stitches together. Step 3. Finishing the dress. Spread crocheted details on the flat surface, cover with wet fabric and let it dry. Make button bands for coquette. Crochet 4 rows: 1 row sc, 3 rows dc. Make 3 buttonholes. Sew back seam of the skirt. Leave 10 cm unsewed and crochet it with one row of sc. Sew a skirt to coquette. Crochet a neck line with one row of sc: after each 3d stitch work two stitches together. It was not that difficult to crochet this dress for your little girl, was it? Happy crocheting!